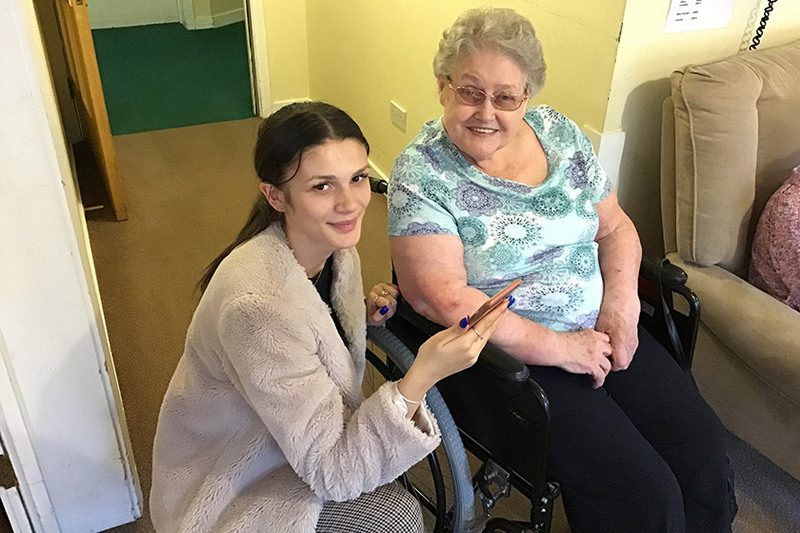 Students have been teaching residents in a Sanctuary Care home in Redditch how to be confident elderly internet users with an intergenerational activity session. For residents at Sanctuary Care’s Brambles Residential Care Home, a care home in Redditch, using Smartphones can seem daunting, but local students armed with their beloved mobiles have been giving them a helping hand with everything from browsing the internet to exploring the benefits of social media for the older generation. Sixth Formers from Tudor Grange Academy in Redditch have been showing our residents how to embrace technology in their care home, showing them how easy it is to go online using Smartphones and become confident elderly internet users. Within minutes Laura shows Denise how quickly older people can feel at ease using the internet. She shows her how to use Google to explore things which interest her. They search for Denise’s first school, which gets them reminiscing about school days, school dinners and they are soon laughing about the doorstep sandwiches Denise’s mother use to make her! Then they start to explore YouTube and Laura finds Dame Vera Lynn’s White Cliffs of Dover to play to her. They are now browsing everything from favourite holiday destinations and reminiscing about swimming in the sea, to restaurant menus which leads to a discussion about their favourite types of food. Laura shows Denise how to catch up television programmes you have missed, which gets them chatting about Coronation Street and Hollyoaks. You can see Denise didn’t expect to be able to do so much using a Smartphone and is starting the see the wide benefits of becoming an elderly internet user. Elsewhere, residents at Upton Dene Residential and Nursing Home in Cheshire have also been embracing modern technology in their care homes, joining the ever growing army of older people using the internet by exploring Skype and getting to grips with iPads. The students also showed residents how to use Snapchat, send emails, look through their favourite photographs and play games, as well as explore different apps such as ones that teach different languages. Remaining digitally included is a really good way for our residents to stay connected which is why older adults and social media can so often be a perfect mix. Martha James – the academy’s Head of Business and IT said of the visit: “Before Christmas we created an outreach project for the sixth formers as part of their enrichment and an element of that was to build links with the local community, which started with a carol service here.